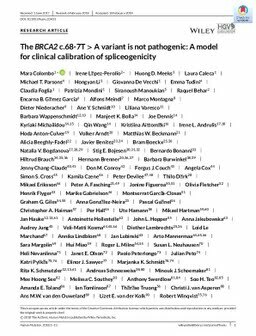 Although the spliceogenic nature of the BRCA2 c.68-7T > A variant has been demonstrated, its association with cancer risk remains controversial. In this study, we accurately quantified by real-time PCR and digital PCR (dPCR), the BRCA2 isoforms retaining or missing exon 3. In addition, the combined odds ratio for causality of the variant was estimated using genetic and clinical data, and its associated cancer risk was estimated by case-control analysis in 83,636 individuals. Co-occurrence in trans with pathogenic BRCA2 variants was assessed in 5,382 families. Exon 3 exclusion rate was 4.5-fold higher in variant carriers (13%) than controls (3%), indicating an exclusion rate for the c.68-7T > A allele of approximately 20%. The posterior probability of pathogenicity was 7.44 × 10-115. There was neither evidence for increased risk of breast cancer (OR 1.03; 95% CI 0.86-1.24) nor for a deleterious effect of the variant when co-occurring with pathogenic variants. Our data provide for the first time robust evidence of the nonpathogenicity of the BRCA2 c.68-7T > A. Genetic and quantitative transcript analyses together inform the threshold for the ratio between functional and altered BRCA2 isoforms compatible with normal cell function. These findings might be exploited to assess the relevance for cancer risk of other BRCA2 spliceogenic variants.